Raiders of the Blood Serpent: Happy New Year! I know, I know, its been like almost forever since I've put anything onto this blog. I've neglected my eldar way too long now to be ignored so rest assure, I will put some paint onto those models that I've stockpiled all this while. I was busy finishing my 4th Company Ultramarines and I'm glad to report that I'm 2 models away from painting all my space marines inventory. Below is the link to my other blog on the progress. Overall I think my average on the models quality are about 6.5-7.0 on CMON rating. I'm pretty satisfied with it. It took me about 6 months to complete the army (in between work, family and moving around). As if I don't have enough on my hands, I just got hooked to Space Wolves! Yep, as I am about to finish one space marine chapter, the next one will certainly start soon. I've just started another blog dedicated to this army and will post up more as soon as I've planned an army list and my next order purchase. So what about my other armies? Well, as for my Imperial Guard http://byzantum.blogspot.com/ I'll be continuing where I left, and even better equipped now with more bitz from my much collected space marines sprues. I'm keen to start off again with some heavy armour. I've got some OOP models like hellhound and demolisher waiting to be assembled. 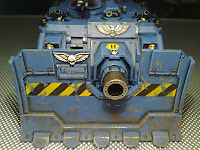 Soon, I'll order some reinforcements like Valkyrie and perhaps a centerpiece for my regiment(a baneblade perhaps?). I think I've experimented and practiced well enough with my space marine mech, and gain more confidence in painting imperial vehicles with the right weathering effects. I've not been updating my Tau blog as well. I have been moving several places lately, due to work and commitments and have not a chance to get in touch with local gaming communities and certainly no gaming activities and battle report for months. Hence there is no posting for an army which I've completed 6 month ago. If time (and budget) permits me, perhaps I'll get my hands on some of those juicy Forgeworld battlesuits, especially the recetly released XV-9. A travelling hobbyist like me who has been travelling with his gear is rather good at being a pack rat. I have a reservoir of newly painted models which i can't wait to give them a baptism of fire as soon as I am able to settle down to a more permanent location and to get to know a gaming club and play some games. I look forward to next year as there is prospect of this happening very soon. Until then, have a great new year everyone!